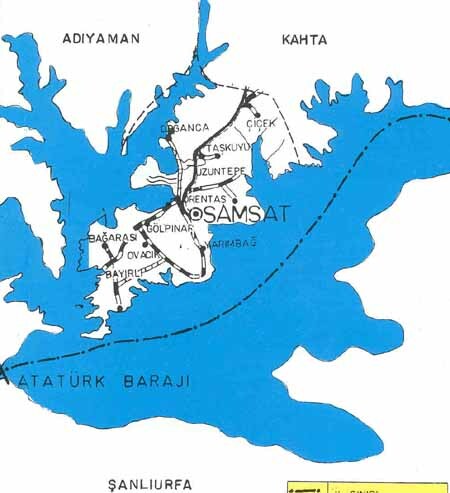 Historically SAMOSATA, village in Adiyaman il (province), southeastern Turkey, on the upper Euphrates River. In antiquity Samosata was a fortified city guarding an important crossing point of the river on the east-west trade route; as such it enjoyed considerable commercial and strategic importance. Probably of Hittite origin, the city was incorporated into the Assyrian Empire in 708 BC. Later it came under the Hellenistic kingdom of Commagene and served as its capital until it was surrendered to Rome in AD 72. Captured by the Sasanian king of Persia, it fell to the invading Arabs c. 640. In the 10th century it briefly served as an administrative military district of the Byzantine Empire and was already in a state of decline when it came under the Seljuk Turks two centuries later. Samosata is also remembered as the birthplace of the writer Lucian (2nd century AD) and St. Lucian, who was martyred at Antioch in 312. Pop. (1980) 2,214. (Samsat). 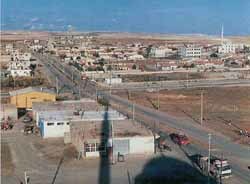 A city on the west (right) bank of the Euphrates in Commagene, on the northern border of Syria. The place guarded an important crossing of the river on a principal thoroughfare from west to east, and was a station on another route running from Damascus, Palmyra, and Sura up to Lesser Armenia and the Euxine (Black) Sea. Samosata was inhabited from the 6th Millennium BC onward. When Commagene became independent in 162, the town was founded by King Samos as his royal capital (c 150). After the Roman annexation of the kingdom by Tiberius (AD 17), Stabo comments on the fertile, though limited, territory of the city, and indicates that it possessed a bridge over the Euphrates (which now flows 500 yards away). The kingdom was revived (38) but re annexed by Vespasian (72), whereupon Samosata, compelled to acquiesce, assumed the name of Flavia, inaugurated a new civic era, and became the capital of an autonomous Commagenian religious union (koinon) within the Roman province of Syria. It was the birthplace of one of the leading authors of the age, the popular philosopher and satirist Lucian (c 120- c 180), who wrote in Greek, though his mother tongue was probably Amharic. When the eastern empire was overrun by the Sassanian Persian Sapor (Shapur) I, Samosata's garrison was withdrawn (c 256) and the city was plundered, but then Valerian chose it as his headquarters and place of refuge before falling into Persian hands (260). After his capture, the quartermaster general Macrianus lodged himself and his staff there in an attempt to rally and reorganize the army, setting up his sons Macrianus the Younger and Quietus as emperors. The region, which was called “Kummuhu” in the late Hittite period, and Commagene in the Greek and Roman periods, is today situated in the Turkish provinces of Adiyaman, Maras and Gaziantep, between the Euphrates River and a range of the Taurus Mts. Mithradates I Callinicus, who put an end to the internal strifeof the Seleucid Kingdom, founded the Kingdom of Commagene in 80 B.C. The golden age of Commagene was during the reign of Antiochus I Epiphanes 62-32 B.C., the son of Mithradates I Callinicus, who remained undefeated. Watered by the Euphrates in Upper Mesopotamia and in control of all passes of the Taurus Mrs., Commagene was a small but rich kingdom. Only in 72 A.D. was it incorporated into the Roman province of Syria by the Emperor Vespasian. The capital city of the Kingdom of Commagene was Samosata (now Samsat) on K5hta (Nympheos) River near Eski Kahta (old Kahta). On a lofty peninsula formed by the river, Arsameia was established as the King's summer city. Besides these, there were other cities such as Perre, Doliche, and Germanicea Caesarea. Samosata, meaning sun, was the birthplace of Lucian 125-192 A.D., one of the famous writers of early times. He is said to have written the first space novel of all times, and of his works, 83 have come down to our day. Among these are: "Talks of the Gods", Talks of the Sea". "Talks of the Next World", "Arrival in the Hereafter", "Graceful Talks," etc. Possessing a satirical style, Lucian criticized the weak spirit of people, and tried to show the lack of logic in the religion. of many gods. Today in Samsat, a town of Adiyaman province, we can see the fortress of ancient Samosata, with its walls, aqueducts and various other ruins. Although archaeologists like S.Muller, Edward Myer and F.Sardinat have investigated the ruins of Samosata, a systematic excavation has not yet taken place.